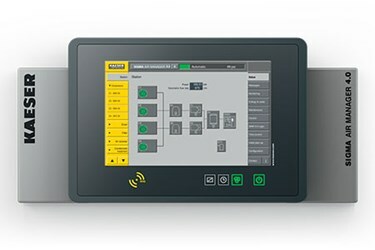 Kaeser’s Sigma Air Manager 4.0 offers complete compressed air system management for industrial plants by tying compressors, blowers, or vacuum units together into a secure Sigma Network. SAM 4.0 can also balance load hours for more effective maintenance scheduling. It’s powerful 3Dadvanced Control improves pressure stability and system reliability, while the built-in Kaeser Connect web server provides remote monitoring and ongoing energy audit information according to ISO 50001 energy management.